Demonetisation: The Biggest Failed Economic Experiment in Indian History? » Italy votes 'No': Why should Indian investors be concerned? Soon, it will be a month since we heard the term demonetization after a gap of thirty eight years. The intent was to target black money. And to check terrorist funding. So far so good. Until you take note of the casualties. Printing new currency...people in queues rather than at work...loss of lives and livelihoods...abandoned projects - a lot has been sacrificed for the failing experiment. The biggest blow has been to the rural economy and the small players in the unorganised sector. The informal sector runs mostly on cash and accounts for 48% of India's total output and 80% of employment. The GDP growth rate comes next. And we believe that the pain will be worse and more prolonged than predicted. The move could even delay the implementation of GST. Low deposit rates for savers are already a reality. One can gauge the government's confidence by the turn the narrative has taken in last one month - from fight against black money to a cashless economy. Parts of India have indeed been rendered cashless...and helpless. And the elephant in the room is political funding that happens mostly in cash and is unaccounted. Thanks to the latest amnesty scheme, the crooked will be allowed to come clean if they declare their unaccounted income and pay a penalty of 50%...and then keep the other 50%. If they had the sense to invest this unaccounted income in assets, even better. The honest taxpayer is made to look like a fool. From threats of tax plus 200% penalty on deposits, Jan dhan account holders who helped convert black money into white for a 'cut 'are now being openly encouraged by Mr Modi (as suggested by his speech in 'Parivartan' rally in Moradabad, Uttar Pradesh). Those who weren't a part of this laundering scheme must be wondering how they can get in on the action. No one is asking what happened to the pre-election claims of bringing back black money stashed abroad. Nor is anybody asking what demonetization does to target black money stored not in cash but in assets such as real estate and gold. And how about preventing the creation of black money in the future? Failed execution of demonetization could have long lasting impact on the lives of people and businesses. So far, the economic logic of the initiative has gone for a toss. We could go on counting the troubles. But that will not help you tread through the crisis. But you can't wait for the tide to turn; it could be far too late by then. That's why Tanushree and her team have developed a system to help you weed out the companies that could crumble under demonetisation. It's vital to test the safety of your stocks and hold on to the ones that will tide the temporary chaos and gain from the earnings upside in the long term. Will demonetisation actually have any impact on the black money? We do believe that investing in the stock market is one of the best legal ways to create long-term wealth. However, that doesn't mean you should start investing in any stock. The statistics are startling. 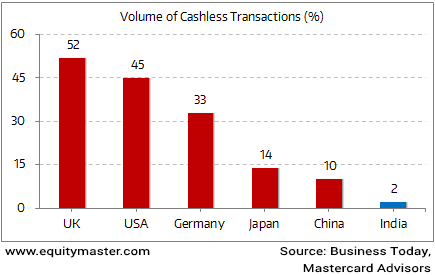 Just about 2% of the volume of economic transactions in India are cashless. Is India Ready to Go Digital? Then, we have just 2.2 lakh ATMs in the country. For a population of over 1.2 billion people, that's a very small number. And guess what? A majority of ATMs are concentrated in metros and cities. For instance, Delhi has more ATMs than the entire state of Rajasthan. Can the common man fully trust that his hard earned money in the financial system will be safe from hackers and fraudsters? And the answer does not seem be a comforting one! Recently a taxi driver in Punjab became a crorepati overnight. Here we are not talking of the moolah that he earned from winning a lottery. But rather the bounty of Rs 98 billion that was transferred to his Jan Dhan account. The glaring mistake was due to a wrong entry by the bank official who accidentally entered the Banking General Ledger account number in the amount column. The mistake was rectified the very next day. But not all such stories end on a happy note. There have been several instances of debit and credit cards being hacked and large sums of money fraudulently withdrawn from the accounts of hapless account holders. And with a large population still not financial literate, they remain gullible to falling prey to such frauds easily. Therefore, unless the whole financial system is made more secure and fool proof, the shift towards a cashless economy can prove to be a financial nightmare for the common man. Yesterday, Italy held a referendum over constitutional reforms. Prime Minister Matteo Renzi had stated that he would resign in case of a 'No' vote. Lo and behold, the people of Italy voted a big 'No'. So why should the markets be worried? The answer: Beppe Grillo. He's Italy's answer to Donald Trump. Mr Grillo is a comedian (yes, a real comedian), who heads the popular 'Five Star Movement'. This party is opposed to Italy remaining in the Eurozone. Grillo has proposed a Brexit-style referendum if he comes to power. He has about 30% of the popular vote as per the latest polls. This is why markets are worried. In case Mr Renzi's reform proposals are defeated, he might have to step down. After a transition period, elections would be held. If Grillo wins that election, he will become the next Prime Minister of Italy. He could then call for an 'Italexit' referendum. If 'leave' prevails over 'remain', like it happened recently in England, then Italy will have to start the long drawn out process of leaving the Eurozone. In short, there is a big crisis brewing within the Eurozone. And this is going to have major consequences for the global financial markets, including the Indian stock markets. The latest issue of Vivek Kaul's Inner Circle presents an intriguing insight on Italexit from our global team of experts in London and other corners of the world. We strongly recommend you to read it. After opening the day on a weak note, the Indian stock market indices are trading higher with marginal gains. FMCG and auto stocks are leading the sectoral gains. The BSE Sensex is trading higher by 79 points (up 0.3%) and the NSE Nifty is trading higher 24 points (up 0.3%). The BSE Small Cap and BSE Mid Cap indices are trading higher by 0.1% and 0.5% respectively. The euro dropped to a 20-month low in Asia as investors assessed the implications of the resignation of Italian Prime Minister Matteo Renzi after he suffered a humiliating defeat in a referendum over constitutional reforms. Consequently, most major Asian stock markets witnessed selling pressure. Major European stock markets have also opened in the red. This edition of The 5 Minute WrapUp is authored by Richa Agarwal (Research Analyst) and Ankit Shah (Research Analyst). Important metrics to help you judge the quality of reported earnings. Equitymaster requests your view! Post a comment on "Demonetisation: The Biggest Failed Economic Experiment in Indian History?". Click here! 21 Responses to "Demonetisation: The Biggest Failed Economic Experiment in Indian History?" Please let us know what you think of this author's view on stating that demonitization is mandatory for India and was not an option to pass by. It is very easy to speak against than for. Speaking against gets more TRP This is the reason why Media in all form projects Negativity and very reason for our past Generations Present Status and Hope this will not percolate to Future Generation as well. Pray God to Save OUr Future Generation. Your Thought is fine for your opportunistic short term gains.Black money is in circulation in various forms and the action requires in all those forms. The present action is on cash which is hoarded at Home and in Lockers as well as Banks which is not reflected in IT Returns and thus evaded taxes. Any Good Reform takes time to understand its Good Effects. But the Pessimistic do not allow to reach it to its Success by raising its short term failures and exaggerating the same. Hope the literates as well as illiterates and less educated well understand and Fight This Negative Attitude of All Types of Media bearing All The Hardships For the Future Generation our our Country or Else we will face another BRAIN DRAIN. HOPE TO SAVE OUR BRAIN DRAIN THAN LIVE IN THIS COUNTRY WITH SUCH INTELLIGENT PEOPLE. 'It's easier to fool people than to convince them that they have been fooled.' - Mark Twain. Richa, going by the comments on the article, it seems Mr. Modi has easier job on hand compared to you. I congratulate you for speaking up from the other (very visible yet never spoken so frankly) side of the issue. I also wish to congratulate EquityMaster management for letting you express your views. Both the things have become a complete rarity these days. Almost the entire Equity master (EM) Team seem to have been influenced by Vivek and are appearing as if they are eagerly waiting for a catastrophy to happen . While on one hand Equity Master has been advocating about investing in Safe Stocks identified by Stock Select /Hidden Treasure / MicrocapMillionaire Millionnaire team post Demonetisation , on the other hand the numerous articles over the past few days seem to cast a gloomy picture and leave the investor community confused. Should the investors start reading between lines and take these articles as disclaimers for the recommendations made by the EM teams so that they claim later that you were forewarned!. ?.While EM teams have been advocating about long term investing to reap the benefits of investment cycle and unbiased reporting of views on companies , the present article reflects a shoddy short term one sided view of the the entire exercise of Demonetisation. One humble request Let's start accepting that there is going to be large scale disruption in the informal economy and some of the units in the unorganised sector will be embraced in the formal economy , thus laying the foundation for a large formal vibrant sector in future. "There is no gain without any pain " as an adage goes . Only time will tell whether the exercise has been a success or failure.It would be better if EM teams also begin to look into the positives and not draw any "predetermined conclusions" so early. Seems like team equitymaster has taken collective decision to bash government. This is the second feedback I am writing on article from you. How did you already conclude demonetization a failure? Economic and social ramifications both short term and long term are not yet clearly out there, but you are making subjective statements and conclusions. Very disappointing from a team who used to depend on data points. Brainstorming is an amazing exercise. All blinkers are off. No idea is dismissed out of hand as whacky or over the top. No one is complemented. No one is praised. Ideas flow without inhibition. The participants are facilitated spontaneously to break barriers to thinkning out of the box. The scholarship, experience, skills and attitudes of the participants flow in a seamless and creative ambience. At the end of it all a rich tapestry of possibilities stands revealed. The impossible then becomes doable right away while the miraculous may perhaps take a little time ! Please, please start. Let your readers join too. The same usual political rhetoric I see in this column. Any mega exercise of this nature will have some problems in execution and there is no need to keep shouting about that. If so many people need to be involved, by the time it is rolled out, you would have seen most of the black money would have got converted to white overnight. The very reason why Mamata Banerjee and other political parties are screaming is not because of the inconvenience it has caused tot he common man, but because they must have lost big time. Instead of criticizing, you should have shown your brainware by discussing what other ways this could have been handled. Otherwise, it is easy to be a critique and that is what this write up is all about. I am a member of Equitymaster, and I am disappointed at this write up. Richa's views on demonetization smacks a one sided biased view. If even all the money prior to demonetization comes back to the formal banking system, it is a big gain & there will be less cash money in the system, less chance for tax evasion in future resulting in a broader tax base. Besides, fake currency, deactivating money used by underground economy & terrorists is a big gain for the nation. No thought has been given Richa while writing and downright condemning the demonization move. Further, the authors views to move into cashless economy looks to be very shortsighted. To think that all things must be in place before such a move is shortsightedness and is a retrograde thinking. Cashless transactions is to be seen as one opening up tremendous opportunity for future growth of financial inclusiveness and growth of financial sectors in the coming days. It would have been very naive to expect that the black money hoarders will give up their loot without any fight especially considering the fact these guys have very high IQ level but have chosen willingly this path. Personally I feel the article written as a judgement/verdict is too early and based only on the initial/transition pain in the system which the decision has caused. Please have some patience as the game is not yet over. With all the money now back in the banking channel, the real game starts between IT, ED and other departments versus the corrupt givers and takers of black money who would have used innumerable mechanisms to route the money into the banking channels just to avoid the glare and get their money saved. Every day in the print media new stories on such methods surface whether it is using Jan Dhan accounts to using employees bank accounts to route the money by collecting post dated cheques. The real game would be how much the authorities are able to lay their hand on such modus operands and are able to confiscate the amount and prosecute the holders before these folks again withdraw back the money from the system. I am waiting on the real report card of this move which probably will sometime happen in Feb-March 2017 period. I understand present day reporters/analysts being the new generation, patience is the last word in their dictionary but sometimes it is better to display patience than land with egg on the face. This type of Copy and Paste material article without proper editorial check affects the credentials of the Owner.The move is already a success if you see the amount getting Seized,Found in river, in Dump and December is not over yet.Also the figures mentioned in the article do not tally with published numbers as experts are estimating minimum 2 lacs crore gap.Also the amount of awareness created in the nation and the boost to cashless economy and removal of fake currency are clear gains.People have stopped spending on avoidable luxury ITEMS and have realized value of money. I feel net gain and at the end of it Author will be proved Wrong.